Don’t take everything you see in the new movie “Paul, Apostle of Christ” as, well, gospel. Even the filmmakers have said much of what is on screen is conjecture. Compared to today’s information-saturated age, little is definitively known about St. Paul and St. Luke, the film’s two main characters. A bit more is known about the time of Roman Emperor Nero, under whose rule the movie is set. Even the identity of those credited with writing more than half of the books of the New Testament is up for grabs, according to Dominican Sister Laurie Brink, an associate professor of New Testament studies at Catholic Theological Union in Chicago. In the undisputed category are Romans, 1 and 2 Corinthians, 1 Thessalonians, Galatians, Philippians and Philemon. The others, she said, are “variously dated much later than we know Paul lived,” although they originated “from a later Pauline community.” Scholars can make that distinction, Sister Brink said, based on vocabulary, sentence structure and the topics that are addressed. As for the Gospel according to Luke and the Acts of the Apostles, both of which are attributed to St. Luke, “that’s a larger question,” she said. “Who was St. Luke? Tradition has the person named as Luke, and tradition suggests he was a companion of Paul, from a citation based on Colossians.” But beyond that, the trail grows murky. “The person who wrote Luke is very well-educated,” Sister Brink said. “He’s Greek, his diction is very good, his use of the language is very good. He improves on Mark’s Gospel, which he uses as his source. He seems to be familiar with the patron-client system.” Theophilus, who is mentioned in both Luke and Acts, was Luke’s patron. 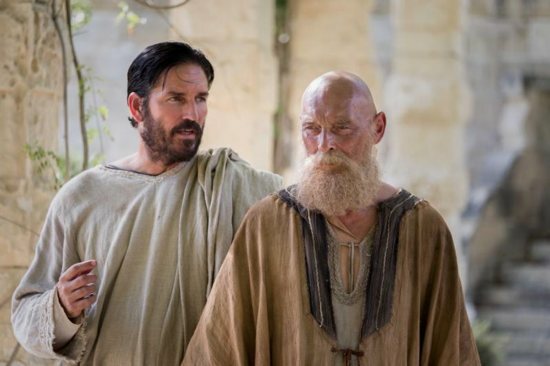 “Paul, Apostle of Christ,” which is to be released in theaters nationwide March 23, has Luke visiting Paul in a prison in Rome. “That makes good cinematography, but since we don’t know the identity of Luke — we just know that tradition has named him that. We don’t see that (prison visit) in the text,” Sister Brink said. Paul is jailed in the movie after having been accused of setting the blaze that destroyed a good chunk of Rome. A small, beleaguered Christian community is shown hiding in an otherwise-deserted Roman compound in “Paul, Apostle of Christ.” One thing of which moviegoers can be sure, Sister Brink said, is that they didn’t live in the catacombs. “That’s a long trope that the Christians were hiding in the catacombs,” she said. “None of that is true. Christians were buried in the catacombs and they often had worship there,” Sister Brink added, but they did not use it as a hideout from the Roman Empire. But by this point in history, though, one plot point in the film rings true: “The Our Father would have been known to this community,” according to Sister Brink. Some scenes in the film mimic events elsewhere in the Bible. “They didn’t have prisons” as we know them today, she noted. Also, a band of younger, agitated Christians stages a raid on the prison to free Paul, but he refuses to leave; in the New Testament, an earthquake wrecks Paul’s jail, but he declined to escape.